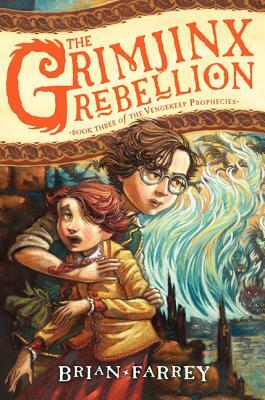 Fast-paced, funny, and full of surprises, The Grimjinx Rebellion brings Brian Farrey's epic and critically acclaimed Vengekeep Prophecies trilogy to an unforgettable close. Jaxter Grimjinx and his family haven't had much time for thieving. Through no fault of their own, they've been too busy saving the day. But the danger in the Five Provinces is only just beginning. The Palatinate Mages are almost ready to unveil their master plan, and legendary monsters will soon roam the land once more. Then Jaxter's sister, Aubrin, is kidnapped by the Mages. It seems she has a power greater than her family ever realized, and she may be the key to the impending battle for the Five Provinces. Jaxter will do anything to get his little sister back—even if it means pulling off the greatest heist of his life and starting a full-scale rebellion. A "rich fantasy" (Publishers Weekly, starred review) with a family of thieves who "couldn't be more likable" (Kirkus Reviews), the Vengekeep Prophecies trilogy takes everything you thought you knew about prophecies and spins it into pure magic.